According to 511 Alberta, Highways 2 and 88 were closed by washouts and overland flooding on the morning of Wednesday, June 13. In the case of the two spots on Hwy. 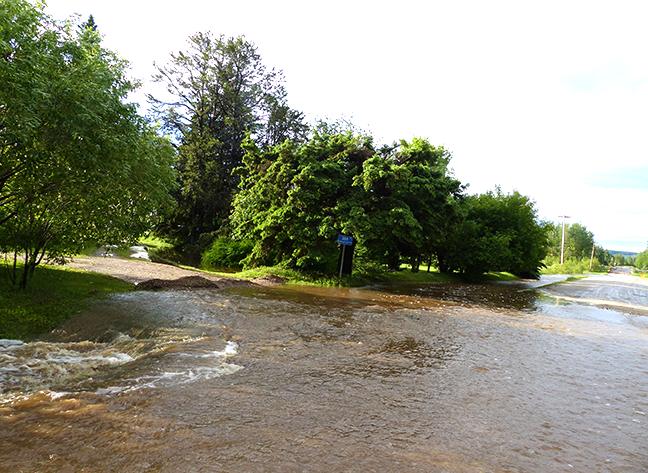 2 near Kinuso, alternative routes were available. But the washout 16 kilometres north of Slave Lake on Hwy. 88 left no alternative but very long detours – either around through Wabasca and Athabasca or via Hwy. 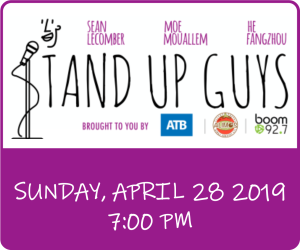 750 to Grouard and High Prairie. No time on the Hwy. 88 reopening was being given on Wednesday morning, but the contractor was at the site and plans were being made for a temporary fix. This was the aftermath of several inches of water that fell on the region earlier in the week. 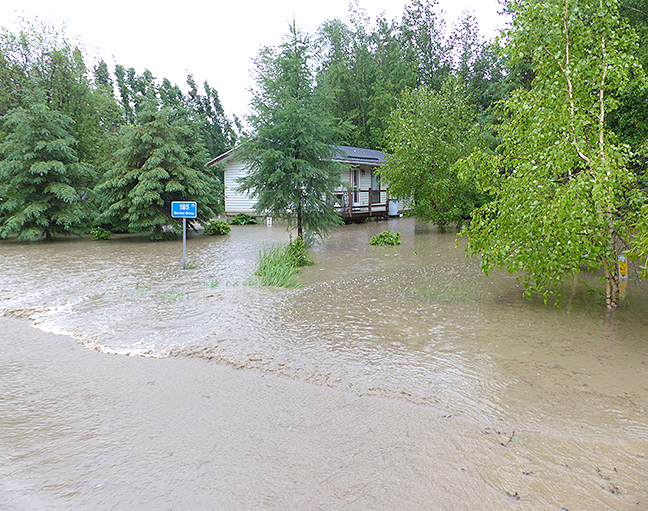 In Slave Lake, low-lying areas of the northeast part of town were flooded and the hospital was threatened by Sawridge Creek. 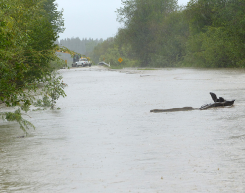 This was in spite of the flood diversion channel doing exactly what it was designed to do. 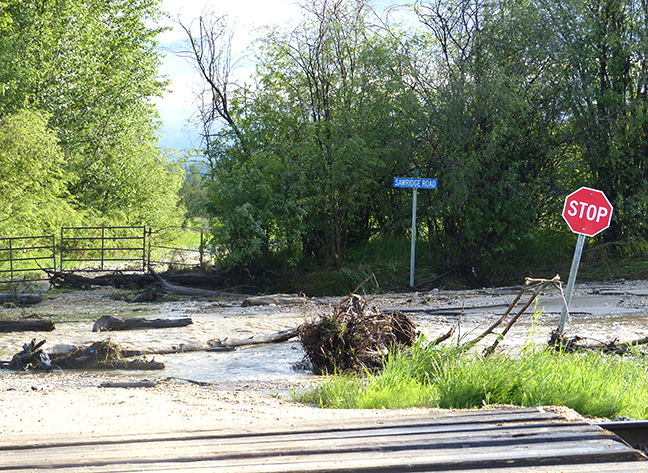 Meanwhile, at about supper time Marten Creek overflowed its banks and started filling up low spots in the lower part of the hamlet. This continued unabated for several hours, by which time emergency officials were strongly urging residents in those properties to find somewhere else to spend the night. Several basements were flooded. All of this was happening under an onslaught of heavy west winds, with gusts (so said the weather people) of up to 90 kilometres per hour. 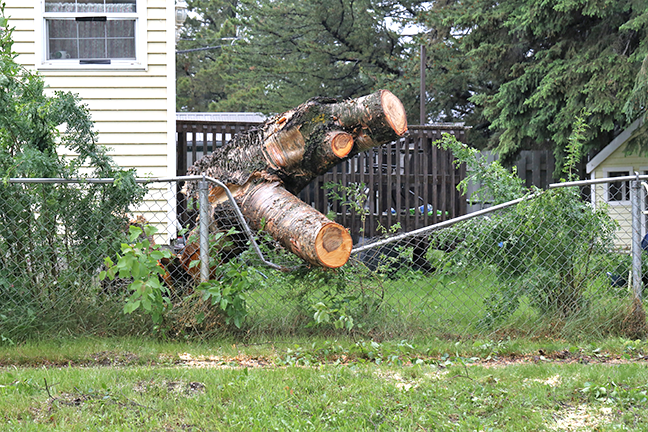 However hard those gusts blew, it was enough to knock over or snap off many trees in the area – a few of which damaged property. 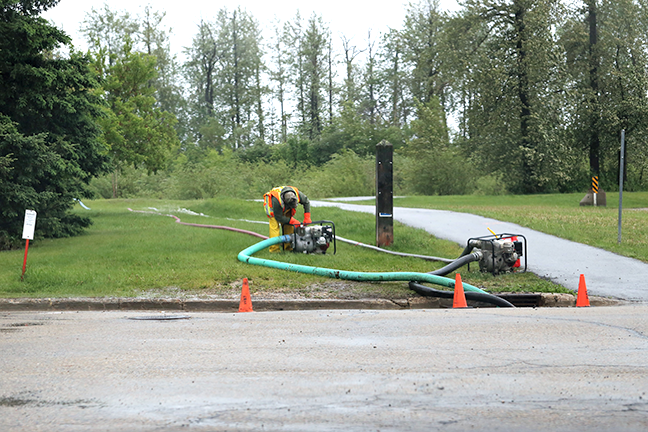 It likely also was the cause of power outages, which started on the afternoon of May 11, and were still going on well into the next day, with large parts of Slave Lake without electricity. 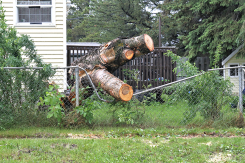 ATCO Electric told The Leader on Tuesday winds and downed trees caused numerous problems and crews were responding as quickly as they could. The scene on the lake was wild, with huge, dirty breakers and flying spindrift. 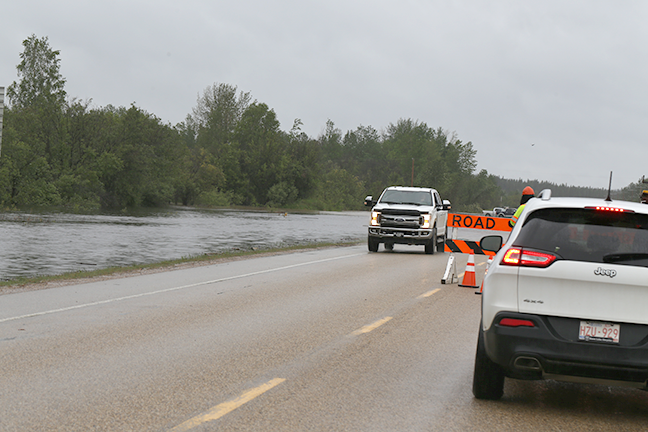 The wind caused the operators of the construction barge at Widewater to prudently seek shelter in the lee of Nine Mile Point for the duration. 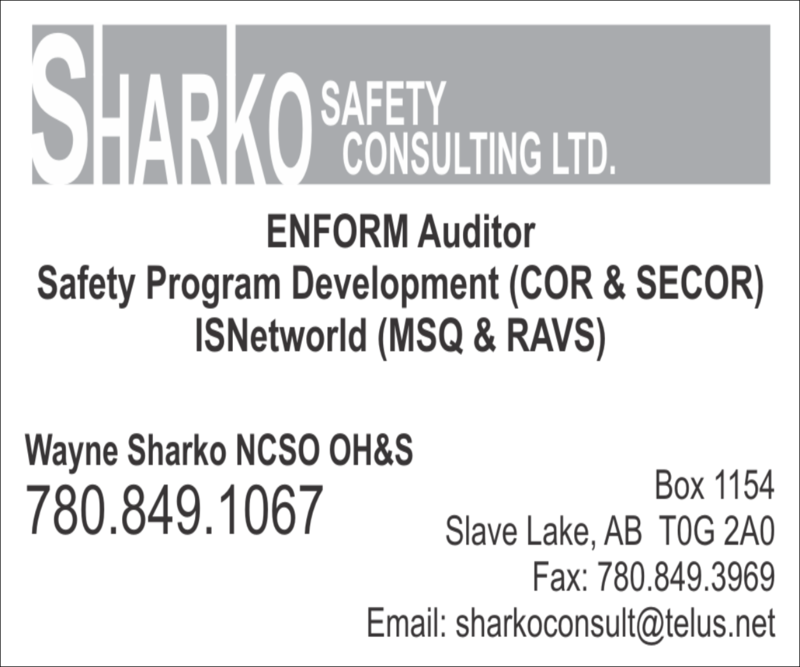 Town of Slave Lake, M.D. of Lesser Slave River and the provincial highway maintenance contractor had equipment at bridges quite quickly on the Monday afternoon. 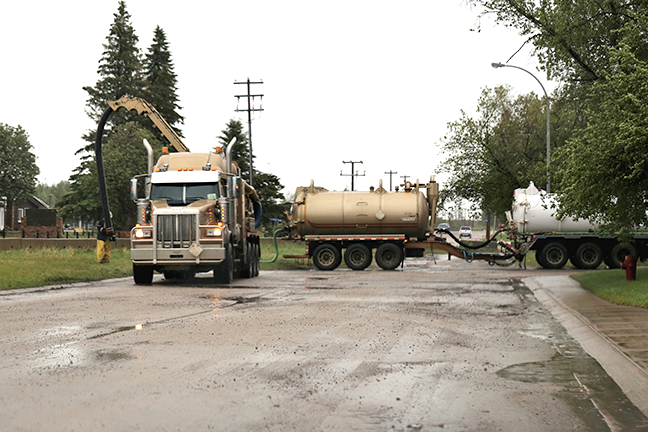 A fleet of hired vacuum trucks were also seen to be going pretty much non-stop through the night and all the next day. According to town manager Brian Vance, it was “touch and go,” but as far as he’s aware the action prevented major sewer backups in that part of town, such as happened in 2011. 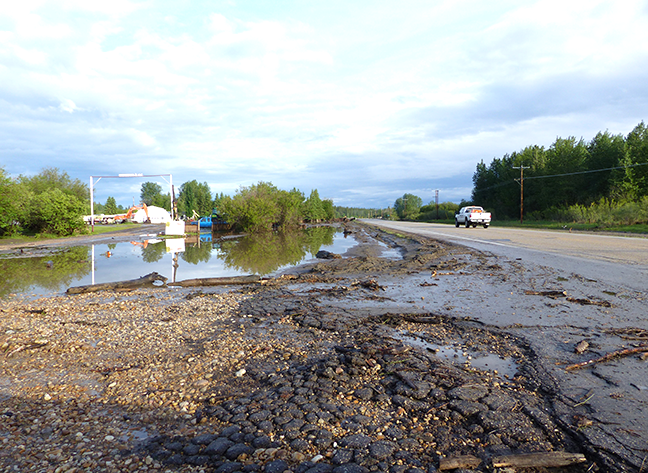 Mooney Creek breached Hwy. 2 sometime during that night, forcing its closure. 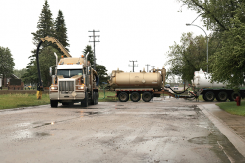 This cut off access altogether between the Southshore communities and Slave Lake, meaning many people couldn’t get to work on time Tuesday morning. 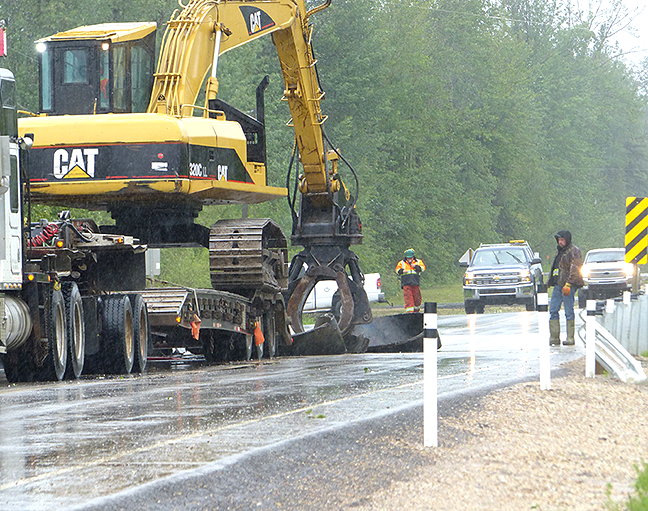 By about 8:00 a.m., one lane had been opened and vehicles were being piloted through. But in the morning Hwy. 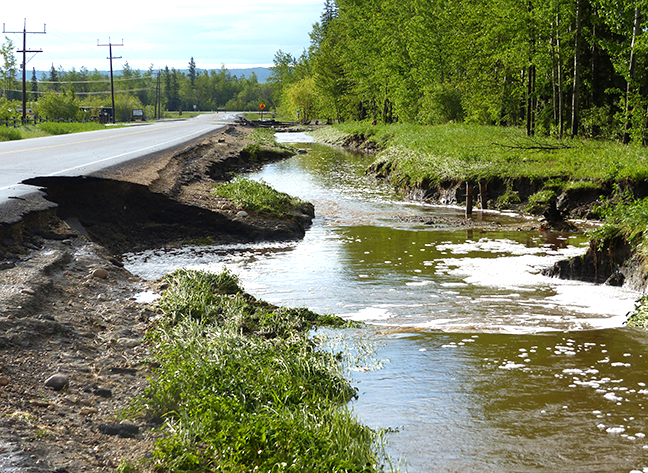 88 north of Slave Lake was closed due to a culvert washout. As of Wednesday morning, that was still the case. The Aberta 511 road condition map also showed Hwy. 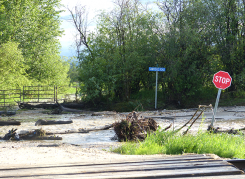 2 in the Kinuso area closed in three spots due to washouts.